I quickly wrote the quote down because it is exactly the reason why I write this blog. My purpose is to help Christians who are leaders become more authentically Christian in their leadership practices. I don’t think it is that hard to figure out a Christian approach to leadership, but it does take time to reflect on your faith and your work and how they intersect. 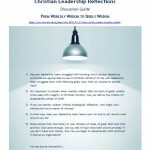 That’s why I call this blog Christian Leadership Reflections. By sharing my own reflections, I hope to help you with yours. If we believe that God created our universe with certain rules for how it works, then we can study it and learn about it. And if God gave us the ability to think, to discover and to create new knowledge, then we should do so. It is inevitable then, that quite apart from God’s revelation humans will work out some knowledge and wisdom about how things work, or the way things are, that is right and aligns with God’s design or his ways. Don’t be surprised when this happens because it is simply the result of the orderly ways of God. But sometimes we get it wrong and develop ideas that are not in alignment with God’s ways. This happens because our values are not in alignment with God’s or we have forgotten to leave room for God. Most often it is just a case of someone who doesn’t know God and doesn’t know any better, but sometimes a person develops something with evil intent such as when a con artist develops a con game based on understanding our (fallen) human nature. Worldly wisdom, therefore, is not like godly wisdom. Godly wisdom is always 100% right. Worldly wisdom has a range, from downright ungodly to wisdom that unintentionally aligns with God’s ways. For example, people with no awareness of God can still do good deeds because they believe it is the right thing to do. The issue isn’t that worldly wisdom is the opposite of godly wisdom, but that even at its very best it is incomplete without godly wisdom. On a continuum from foolishness/ignorance to godly wisdom, worldly wisdom can be anywhere from 100% wrong to being 100% right (about the topic at hand), except for its source. If worldly wisdom meets godly standards, then feel free to use it. So when it comes to Christian leadership, there is much worldly wisdom we can draw upon to understand group dynamics, organizational theory, governance, motivation, planning and so forth. There are many very good secular writers whose models and advice are just fine for Christian ministries. But we must be careful to discern where worldly leadership wisdom is deficient and falls too far short of godly wisdom to be able to use with integrity. And that is why a Christian leader needs to take time to reflect on his or her leadership practices. That is how you tell. Ask the question, Does this align with God’s purposes, character and ways of operating? This is why I say it is helpful if at least one of your ministry’s senior leaders has formal theological education. It is not good enough to just find a verse here or there to justify something. In this context, verses are little thoughts, and you need BIG thoughts. You need to know not just the verses, but taken as a whole, what does Scripture say about God and his ways? What’s the big theological picture? You also need a vibrant personal relationship with God in which you submit to and then experience his leadership. You will get to know pretty quickly how to assess opportunities or methods for suitability. In a commissioned sales environment, sales managers are trained to motivate their staff by appealing to their self-interest and greed. They have them develop vision boards – pictures of all the good things in life they want to have or experience. Looking at these every day motivates them to sell more. Since when would God have us motivate people by appealing to their greed or self-interest? What relationship does this build between the salesperson and the customer? Instead of truly helping customers, the salesperson has objectified them into a means to an end, an end in the best interest of the salesperson, not the client! Does the technique work? I guess so. Is it godly? No. This style of management cannot be introduced into a Christian workplace. Traditional strategic planning is based on analyzing the past to predict the future. To ensure the plan is achieved, staff are evaluated based on achieving goals that support the plan. Where does this leave room for God to do something new? When God told Paul to go to Europe, Paul went. He didn’t say, “I’ll do it on to my next mission trip” or even worse, “I’ll have to work it into my next 5 year plan.” The Holy Spirit blows where he will, and we have to stay nimble and flexible to respond quickly to his leading. Traditional strategic plan also relies heavily on setting your strategy based on distinguishing yourself from a competitor, but God wants you focused on what he has called you to do. In traditional strategic planning, your strategic options are limited by your SWOT analysis. Since when has God been restrained by your weakness? I’ve written more about this in Strategic Planning for Christian ministries. Strategic planning can be done, but be careful to design the process to include God! What is this advice or method based upon? What assumptions does it make? Why does it ‘work’? How would this affect the way I relate to another person or group? Why does this appeal to me? What emotion or motivation makes this solution desirable? Does the appeal call upon something in me that runs counter to the fruit of the Spirit? How does it maintain or contribute to my status as “a holy vessel, consecrated to God” and to our ministry’s representation of what life in the kingdom of God looks like? Then compare your answers to what you know of God. Be wise. Be discerning. Take time to reflect.